" A highly proficient dancer in the traditional techniques of Kathak, Aditi Mangaldas has broken through the rigid Kathak form and choreographed original expressions using the kathak base but intermingling it with contemporary insights, she is highly intelligent, has a fine stage presence and a sensitivity which enables her to interpret the voices of today in an original form. " Aditi Mangaldas is a Kathak dancer who works with the traditional repertoire of Kathak and infuses it with modern sensibilities. She is regarded as one of the leading dancers in both the traditional and contemporary idiom and has performed in major cities of the world to critical acclaim. Besides solos she has choreographed a number of group ensembles that have been both traditional and contemporary in nature. 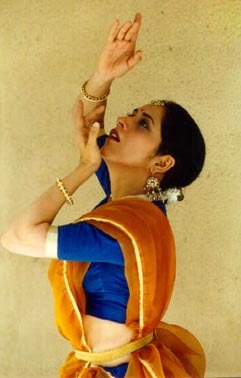 She is the artistic director and principal dancer of the Drishtik Dance Foundation.
" I do not belong to a family of dancers. On the one side they have been business people, on the other intellectuals in the field of philosophy and the sciences. And yet the desire to create was born early basically due an atmosphere of freedom. An ambience in which ideas and imaginations were encouraged to flow and flower. An opportunity was provided to explore our potential in various fields. Most importantly , a respect and equality given to me as a young girl child. I started to dance at too early an age to really know why I did. My parents tell me of how I would gather my extended family, jump on to the dining table, dance and expect them to applaud. They probably felt that I may have some talent in 'communication' of some sort. I started off with dance, music, painting, physics, chemistry and mathematics. Each one dropped away as more and more, dance came to be my medium. With my first guru, Smt. 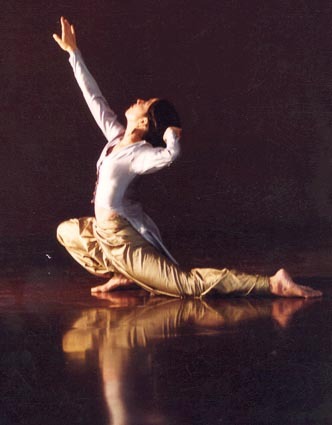 Kumudini Lakhia, one of the pioneers of introducing contemporary directions to kathak and one of India's leading choreographers, I learnt the essence of dance. The need to be free and fearless. The relation of my body to the space that surrounded me. From my second guru, Shri Birju Maharaj, the scion of the traditional kathak family and India's greatest kathak maestro, I learned to love dance as though it were human. The need to feel it's all encompassing beauty. The relationship of my central core to the space that is within my body. I have a wanderlust. Just like people who roam the whole world, explore its remotest corners and try to fathom what lies beyond the earth, the solar system, the universe. I like to travel through my body and my mind. To explore new places, new routes , diverse avenues. To travel through various parts of my body and to let these parts travel through different parts of space. Would it be possible to watch the space within you, like you watch the space outside of you? As you see a dancer move through space, could you see the space move through you? " This page is made by KidNET BBS, and is hosted by the ICCR.